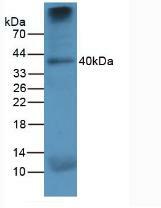 Cathepsin K antibody LS-C663575 is an unconjugated mouse monoclonal antibody to Cathepsin K (CTSK) from human, rat and pig. Validated for WB. Unconjugated. Also available conjugated with Biotin, FITC, Biotin, FITC, Cy3, Cy3, HRP, HRP, APC, PE, PE, APC, Cy7, APC, Cy7, APC.